A deposit is required for the key card. ∗The deposit is refunded when you insert the key card into a refund machine. All day tickets are valid until end of night skiing on the final day of the ticket. 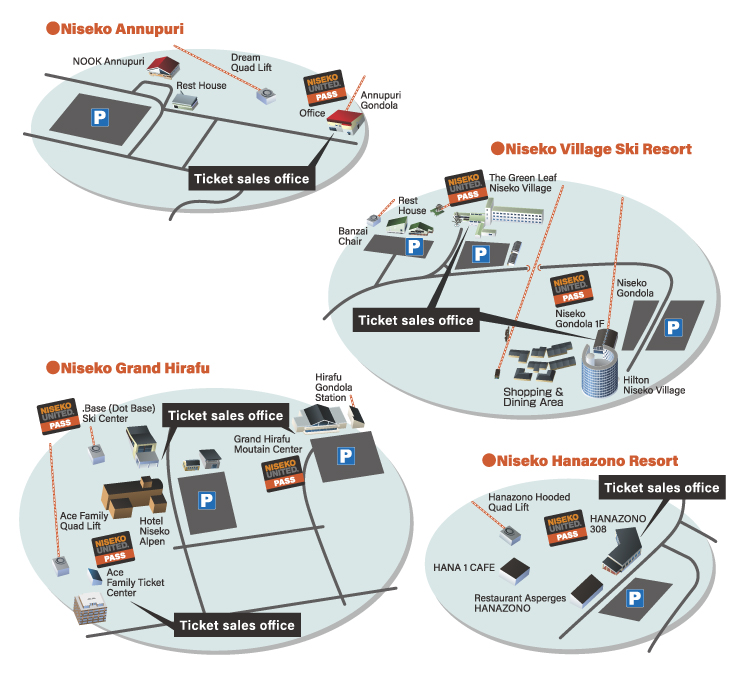 Niseko United wishes to advise that seasons passes are not transferable. that the person using the pass is the original purchaser of the pass. Any passes being used by persons other than the original owner will be cancelled. Hours and days of operation are subject to change according to snow and weather conditions. Proof (student card,driver’s license) is required for age 13 – 15 and seniors’ discounts. Preschoolers must either be accompanied by a guardian or proof of age identification. For Point Ticket holders,each gondola ride costs 4 points;each high-speed lift,2 points;and other lifts,1 point. Night skiing tickets are available at each ski area. Lift rates are subject to change. Operation dates and times are subject to change at each ski area. On other days 8:30 to 16:30 (8:30 to 16:00 in Hanazono Area). A deposit of 1,000 yen is added to the lift fee when the ticket is purchased. The deposit is refunded when you insert the key card into a refund machine. Refund machines are located at each ski area. The deposit will not be refunded for damaged or expired cards. For more information,please contact our staff.